So begins The War of the Worlds by H.G. Wells, but some did believe it 80 years ago on Halloween in 1938. 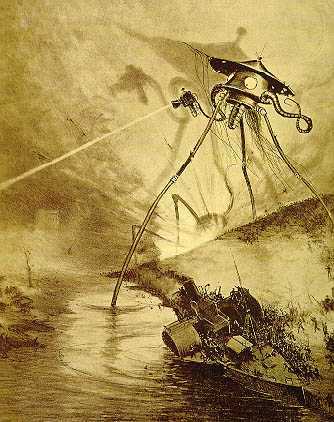 Orson Welles’ fake news report based on the 1898 novel tricked many people into thinking it was a real invasion, if not by the Martians then by the Germans. The radio broadcast was scarily realistic (listen to a clip here). The 120 year old novel is hugely influential in giving the world extraterrestrial consciousness and opening narrative wells that produced countless sci-fi stories (although it does have a few racist attitudes of its time). H.G.Wells once met Orson Welles in this interview. Picture by Alvim Corréa, 1906 edition. This entry was posted on Wednesday, October 31st, 2018 at 8:25 am	and is filed under Sci-Fi. You can follow any responses to this entry through the RSS 2.0 feed. You can skip to the end and leave a response. Pinging is currently not allowed.